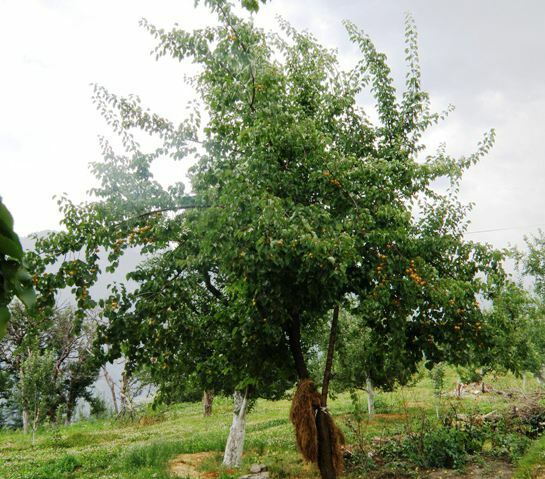 Chulli is a type of apricot that grows wild in the dry temperate region of the Western Himalayas falling within Kashmir and the Indian state of Himachal Pradesh adjoining Tibet. The altitude of this region ranges between 2000-2500 m . As monsoons fail to reach these areas, so this region , so the annual rainfall here around 25 cm. Most of the precipitation is in the form of snow during winter. The minimum temperature during the most part of the year is below 0 C. The growing season is quite short. Further, the soil of this region is hard and shallow. Chulli is a spreading tree, round topped, 5-7 m high, spread 6 m, trunk girth 56 cm, bark reddish brown. Leaves broadly ovate, apex cuspidate, base cordate, margin serrulate, pose intermediate, lamina green, upper and lower surface pubescent, length 6.81 cm, breadth 5.73 cm, length/breadth ratio 1.19, petiole pubescent, colour red, length 2.80 cm; glands shape orbicular, colour dark tan, 2-3 in number. The flowering period extends between 16th and 28th March. Flowers white with a pink tinge, diameter 2.9 cm; petals 1.24 cm long, 1.13 cm broad, stamens 38, 1.03 cm long; style straight, yellowish white, 1.17 cm long. Fruit round with compressed sides, apex depressed with russetted dot, base round, colour deep yellow with red blush, length 2.74 cm, breadth 2.59 cm, weight 11.53 g, TSS 13.5%, acidity 2.24%, total sugars 5.54%, reducing sugars 3.55%, non-reducing sugars 1.89%. Stone shape ovate, surface rough, free stone, length 1.8 cm, breadth 1.55 cm; kernel shape ovate, length 1.49 cm, breadth 1.55 cm. The flowering takes place between during the second half of March. 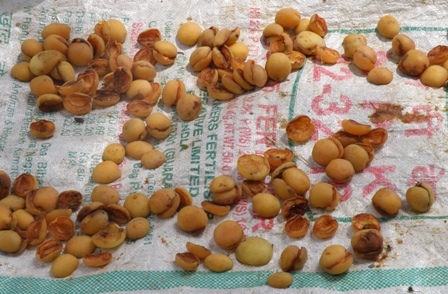 The fruits ripen between 15 and 30 July. The fruits are eaten. 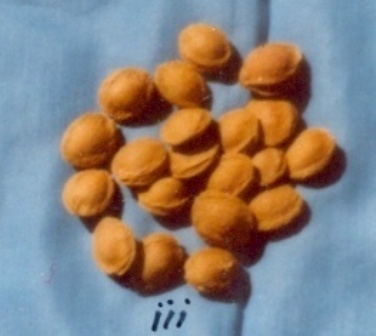 These are also sun-dried. The dried fruits are mostly used for the preparation of a hard alcoholic liquor which is very popular among the tribesmen of that region. 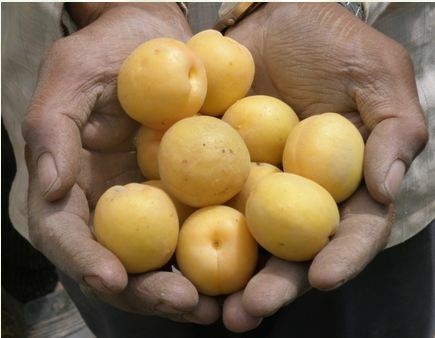 Chulli is much prolific bearer than the cultivated apricots. The kernel tastes sweet in most cases and is eaten. The kernel contains 48.6% oil. This oil is used for cooking and as hair oil. The oil is very helpful in curing arthritis and joint pains. Consequently, it is in good demandWood of a chulli tree is used for timber and also as fuel. 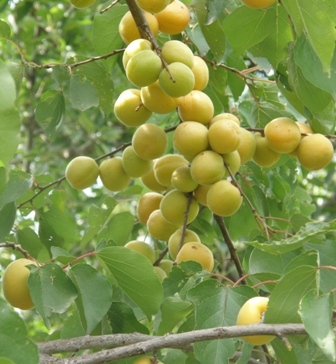 The seedlings are used as rootstock for apricot and plum.